The `Battle of the Adyar River’ fought in October 1746 is today a lesson in management. It is recalled often in military and management schools. Fought in the shallow land off Quibble Island, between a few hundred French-led Indian sipahis with cannon and thousands of indisciplined forces of the Nawab of Arcot rallying to the support of the British ousted from Fort St. George, it ended in the rout of the latter. It also demonstrated what the disciplined firepower of a few could do against unorganised thousands. It was a lesson the British were to learn well and led to their formation of the regiments that were to prove the nucleus of the Indian Army. What was built as the San Thome Redoubt for the Mylapore Garrison by the British in 1751, two years after taking possession of Mylapore-San Thome, was redeveloped at the northern end as Leith Castle. Above photograph is of the Leith Castle property as of today. This place was earlier Parry Castle. Thomas Parry, who had founded Parry & Co, today the second oldest surviving business house in India, established here in 1805 the first industrial factory on record in the city of Madras. It manufactured and exported boots and leather equipment for the armies of several countries. The area on the north bank of today where the Nawab’s forces milled around aimlessly, between San Thome Fort and the river, was where several garden houses of the British were to be built between the 1790s and the 1890s. The oldest house was Moubray’s Gardens, now home of the Madras Club. Next, there rose Brodie Castle, now Thenral, the TN College of Music. Later homes by the eastern sea were Somerford, now part of the Chettinad Palace campus, and neighbouring Underwood Gardens, where the Regional Manager of the State Bank of India lives. At the western end, near Moubray’s Gardens, were Pugh’s Gardens, where the Sathya Sai Baba shrine has come up, and The Grange, now called Kanchi and from where the Government’s management training institute functions. Between houses by the sea and the garden houses in the west was developed Bishop’s Gardens, renamed Vasantha Vihar and now the headquarters of the Krishnamurthy Foundation, and several others on land on which houses for ministers and judges have been built. If you have memories of the Leith Castle area send in your comments below. The residents of Leith Castle area do not want street names to be changed check the report of this here. This entry was posted on Friday, July 2nd, 2010 and is filed under Civic. You can follow any responses to this entry through the RSS 2.0 feed. You can skip to the end and leave a response. Pinging is currently not allowed. The present `Leith castle`was built in the year 1929 by one Mr. Arogyasamy Mudaliar, a catholic by faith. His bought about 1 cauney 9 grounds and 994 sq.ft of vacant land from M/s. The Madras Catholic Co-Operative Building Society Ltd for Rs. 8,938-14-11 by means of a sale deed registered as document No. 1436 of 1928. Later on he availed a building loan of Rs. 20,000/- from M/s. The Egmore Benefit Society , Third Branch, Ltd on 11-07-1932 (Document No. 1228 of 1932). Arogyasamy Mudaliar passed away in 1933. His sons availed additional loan of Rs. 18,000/- from M/s. Indian Mutual Life Association on 31-5-1937 and completed the construction of the building now called `Leith castle. (Mortgage Document No. 1059 of 1937). 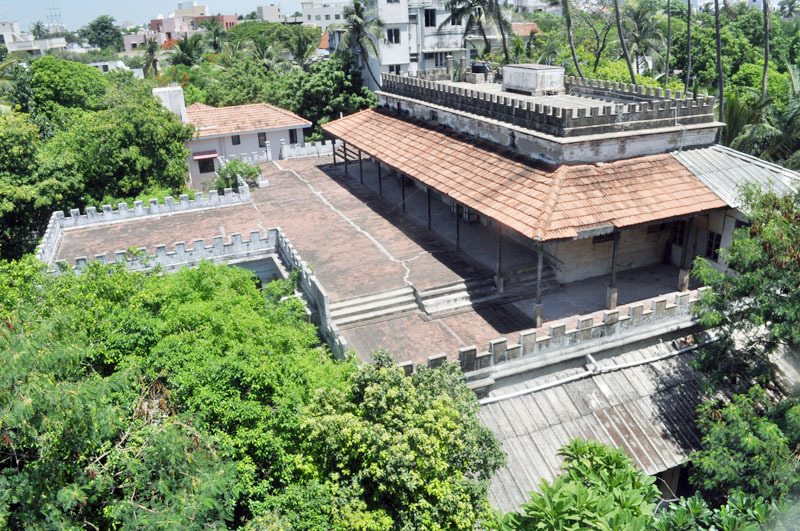 This building was sold to one Mrs. Veeralakshmi Ammal, Zamindarini of Bodinayakanur for Rs. 63,000 in the year 1939. Thus this building has got nothing to do with the `Leith Castle` said to have been built by an European in the 1800s. The new building was named after the old Leith castle. Henry Newill, an ancestor of mine who was in the Indian civil service from 1840 -69 had a daughter named Maria Helena Newill aka Lena. She was an artist & she married Daniel Chamier in 1890 & when she died in 1918 Leith Castle was given as her address.